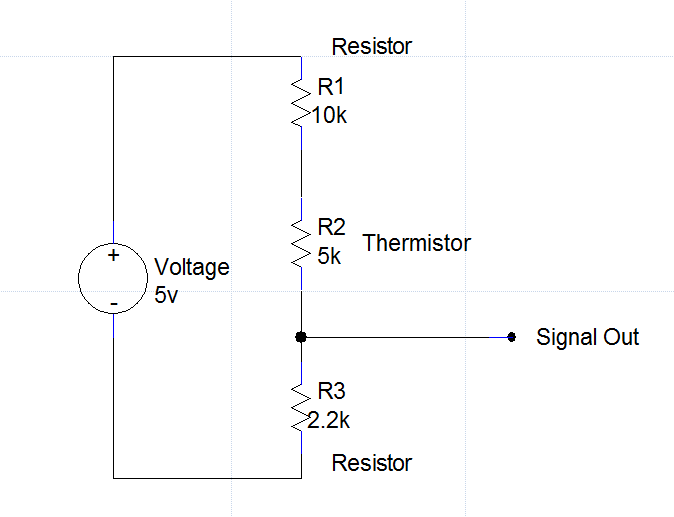 First you will need to build a voltage divider to convert the thermistors varying resistance to a varying voltage source to feed the analog input of the microcontroller. The voltage source and resister values can vary, all you want is to not pull too much current (use high value resistors) and provide a wide voltage range for the microcontroller for best accuracy. 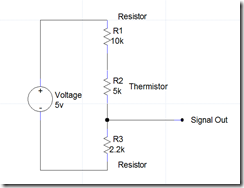 The microcontroller will receive a raw value that will need to be scaled. The zero and span of the raw value will vary depending on the voltage range of the analog input on your microcontroller. My Arduino analog input is 0-5vdc, some Arduinos are 0-3.3vdc, Industrial equipment is usually 1-5vdc 1-10VDC or 4-20ma. The raw value inside the controller will vary depending on the resolution of the analog input, The Arduino Uno’s ADC (Analog to Digital Converter) is is 10 bit so at 0vdc you will read 0 raw and at 5vdc you will read 1023 raw. Industrial ADCs often use 15 bit resolution so zero and span will be 0-32767. This raw number then must be scaled to what ever unit of measurement desired, in this case degrees Fahrenheit. Scaling in the software usually requires Gain (multiplier) and Offset (add or subtract). Then lets use a proportion equation like this: 50/1 = 148/x to find x simply cross multiply and divide (1*148)/50=2.96. This is how much we will divide the raw number by. Note: To be completely accurate with the definition of gain (multiplier) we would find the inverse so 1/2.96 = 0.33784 then multiply our raw number by it however I apologize, in my code example I just divided by 2.96, same result. In the Arduino who cares but in some industrial applications they will expect an actual Gain(multiplier). Offset is how much we need to move the value up or down. We will figure this on the lower values tested which was 35DegF-417raw. We will take into account that we will be dividing by 2.96 In this example equation: (417/2.96)-35=129. Since the methods I used to running up and down the temperature were quite primitive and not very accurate (bag of ice and my hand verified with cheap thermometers) I expected to have some fine tuning to do. After you get the scale close you can tweak the Gain and Offset to get the reading as close as possible. Also read the data sheet on your thermistor, most are not exactly linier so even with the perfect Gain and Offset there will be error. P.S. This scaling procedure works with just about any analog input, i.e temperature, pressure, voltage, humidity, etc..